Although the Tribe has not yet settled its water rights claims, it has been assigned a federal negotiating team. The Tribe relies on well water to meet its domestic needs. Of crucial importance to the Tribe is protecting the natural features of Havasu Canyon. The canyon is famous for its blue water and spectacular waterfalls. 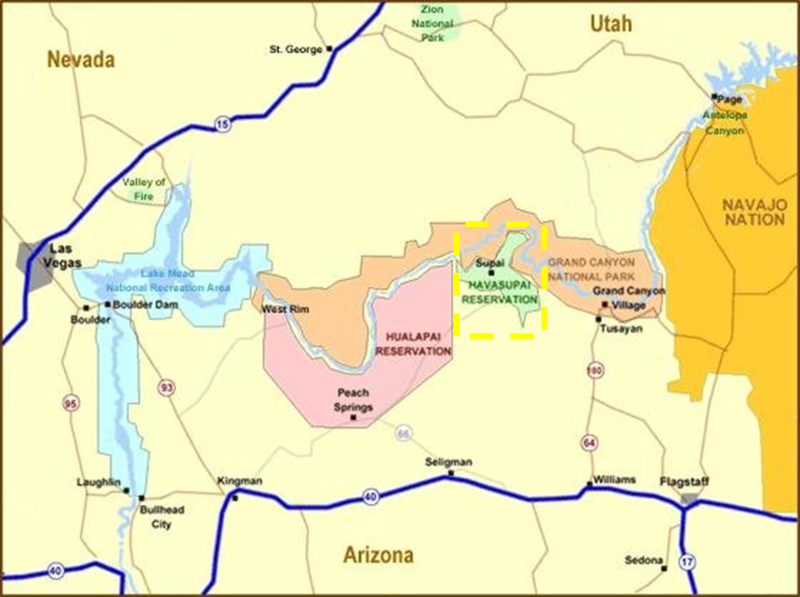 [i] Inter-Tribal Council of Arizona, Inc., Havasupai Tribe, http://itcaonline.com/?page_id=1160 (last visited April 23, 2013). [ii] 465 people live on the reservation (U.S. Dept. of Commerce, U.S. Census Bureau, American Factfinder, http://factfinder2.census.gov/faces/tableservices/jsf/pages/productview.xhtml? (last visited April 23, 2013). ); the population of the Havasupai Tribe is 639 (Inter-Tribal Council of Arizona, Inc. supra.). [iii] Havasupai Tribe, http://www.havasupaitribe.com/index.html (last visited April 23, 2013). [iv] Inter-Tribal Council of Arizona, Inc. supra. [v] See Earthjustice, Grand Canyon Uranium Mining Ban Defended by Havasupai Tribe, Conservation Coalition, March 13, 2012, http://earthjustice.org/news/press/2012/grand-canyon-uranium-mining-ban-defended-by-havasupai-tribe-conservation-coalition; Cindy Cole, Tusayan water at issue, AZ Daily Sun, March 6, 2012, http://azdailysun.com/news/local/tusayan-water-at-issue/article_d7ae21e3-c1ba-5936-98d5-f373cee94445.html.